Our expert "blanket men" can work with facilities staff to coordinate, design, fabricate and install a removable and reusable insulation blanket system where conventional insulation won't work. Anchor's blankets have numerous applications and are the ideal solution for valves, pressure reducing systems, heat exchangers, access ways, turbines, or flexible, rotating or vibrating equipment. These are an excellent replacement when conventional insulation has been removed and discarded and blanket systems have a typical return on investment of one or two short years. Our on-site measuring phase is not disruptive and our fabrication is off site, eliminating down time often associated with our technicians in your facility. With the availability of various cloths, blankets can be used in wet or outdoor conditions in a wide temperature range and all fastening is stainless steel for long life. 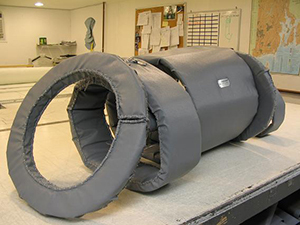 Call the "blanket men" at Anchor Insulation to learn more about removable insulation blankets, or click here to contact us online. We have offices and crew in Rhode Island ( RI ), Massachusetts ( MA ) and Connecticut ( CT ).